Jive Poetic, a Brooklyn resident, poet, teacher, and DJ, is a prime example of literary intellect with a hip-hop foundation. I rely on his poetry when introducing forms. He writes in formal forms including pantoum and iambic pentameter, proving extremely helpful in disabling a student’s fear of poetry. His topics includes personal reflection, introspection, and media analysis. Brooklyn is a hotbed of talent, home to the greatest thinkers, writers and musicians. I am a lucky woman; this art of performance poetry allows me work with such inspiring and transformative artists. It constantly feeds me the best parts of Brooklyn. 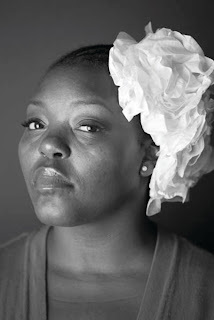 Mahogany L. Browne is the poetry program director for the Nuyorican Poets Cafe and curates its famous Friday Night Slam. See her perform with a host of amazing spoken word artists, musicians, and dancers in Poetry 2013: Game Changers at the BAM Harvey Theater this weekend. ***** A five star evening at BAM Harvey Theater/ Poetry 2013:Game Changers. On display was the rich talent of masterful storytellers, musicians and dancers that seduced the audience with their treasure of words, movement, music and unrestrained joy. Loved it!!! A heartfelt thank you to all. Continue to spread the love.